After years and years of the same, we were tired of leaving Santa the same old boring chocolate chip cookies every Christmas eve. Last year, by unanimous vote, we decided that these fun, fancy ‘cookies’ were the perfect thing for a change.These are so simple, they’re a perfect Christmas break activity for the kids. Even the youngest son got in on the action. The sons were so happy last Christmas morning when the woke up and discovered that Santa had liked them so much, he ate almost the entire plate. Poor Santa. That (and all the milk) probably led to a giant belly ache. I wouldn’t know or anything. Just a guess. The big guy and I are tight and everything, but not that tight. Shake things up for Santa this Christmas Eve at your own house with these colorful Christmas ‘cookies’ or just have them as part of your celebration. However you decide to use them, whenever you decide to bake them they will be sugary sweet and perfect for the occasion. 1. Prepare baking sheet with wax paper. Spray wax paper with non-stick cooking spray and set aside. 2. In large saucepan or Dutch oven, melt butter over medium heat. Add marshmallows and stir continuously until melted, scraping sides of pan so sugar crystals don’t form. 3. Turn heat to low. 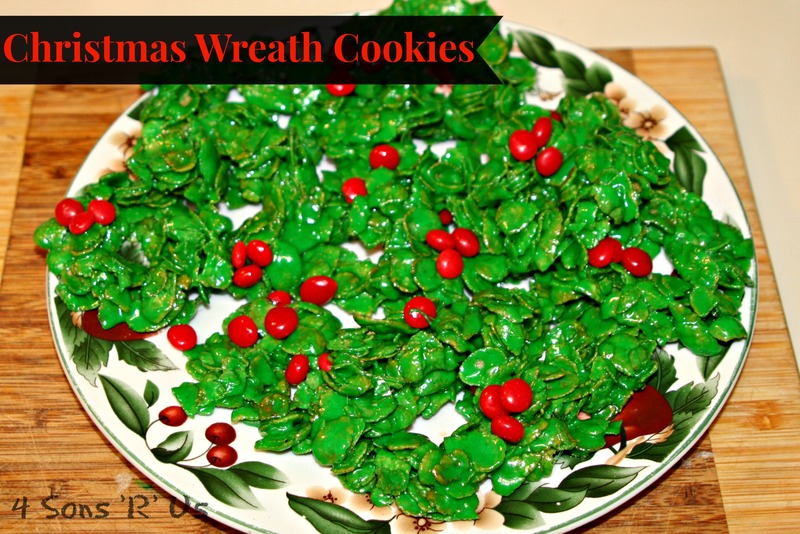 Add peppermint extract and green food coloring and mix well. Add white chocolate chips and stir until melted. Add cereal and mix well until all cereal flakes are well coated. 4. Coat hands with some of the non-stick cooking spray. 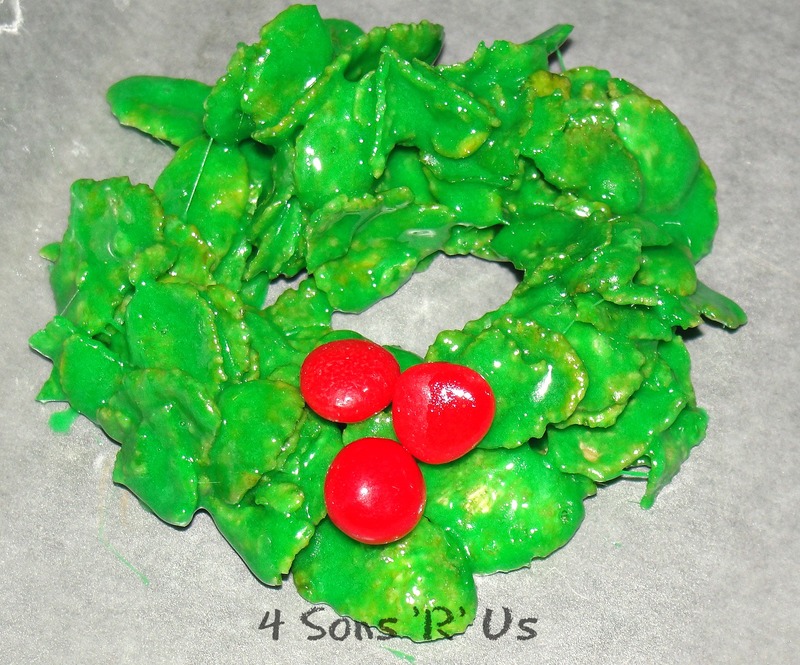 Take about 1/4 cup of cereal mixture and form wreath shapes on wax paper coated baking sheet. Decorate each wreath with 3-6 cinnamon candies. I opted for 3 so they looked like Poinsettia leaves. Allow to cool for about an hour before serving. Store in an airtight container in single layers separated by wax paper or on baking sheet covered in plastic wrap for 4-5 days.